Who Are the New Homebuyers in Texas Suburban School Districts? Since the Great Recession, there have been fewer relocations to Texas’ suburban districts. In the Austin area for example, the once high growth eastern school districts of Manor and Del Valle have been seen very slow growth and some declines – due mainly to the post-recession crackdown on mortgage availability that put a stop to this eastern Austin area boom. Manor I.S.D.’s boom years had student increases up to 18% and 19% — with a 93% increase in the five years prior to the bust, i.e., in 2002 to 2007. Then, there has been an only 13% increase when totaling all past five years, with an increase of less than 3% in overall enrollment in Manor I.S.D. this past year. In sum, this School District has never increased substantially after the 2007 downturn. If we look at the numbers buying houses today, the highest increases in Austin area enrollments are in the Liberty Hill, Dripping Springs, Wimberly, and Lake Travis school districts – where the baby boomers are still having a huge impact. In other words, enrollments are going up due to millennials moving in, but a greater proportion of growth is due to the baby boomers – who are driving the homebuying market in those same school districts. In these school districts, the homebuying market is bifurcated between two growing populations — the young (under age 35) and the old homebuyers (60 and over). Nationally, the Austin-Round Rock Metro Area is now the 2nd fastest growing population of adults age 65 and older – and is the fastest growing of pre-seniors, ages 55-65 (Census Bureau’s American Community Survey: 2011-2016). In Northwest Austin area, there has been a 38% increase in pre-seniors in five years, and a 25% increase in those 65-plus. Nationally, the median age of homebuyers is 45, up from 31 in 1985. 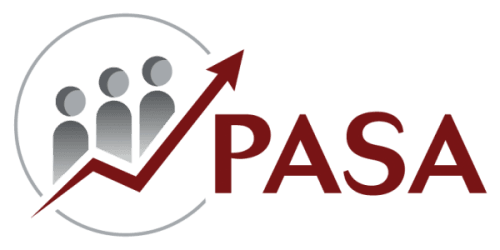 And, when PASA studies the proportionate growth in population cohorts in suburban school districts, it tends to be the baby-boomers who have increased significantly in the past five years (through 2016), and not the millennials. In fact, in PASA’s analysis of growth by age cohort, the millennials normally have not increased by more than one percent in most suburban school districts (again, based on ACS data). This data above is important in planning for near-term enrollment trends, but over the long-term we will see a greater proportion of millennial homebuyers — who will bring young students with them. The millennials are already big homebuyers nationwide (now ~34% of all buyers), but young buyers are not having the same impact on suburban Texas currently. In the U.S., average homeowners are now staying in their home for 10 years – the longest time frame ever recorded by the National Board of Realtors. In 1985, five years was the norm. But, Texas should be more transient than the nation, especially in the growing suburban school districts, where newcomers alone help explain a much shorter tenure in owned and rented housing units. Based on the 2016 ACS data, both the high growth and low growth Austin school districts show high relocation rates. 82% of the Austin area population, including renters, kept the same residence for the previous 12-month period – with 18% relocating within that year. Austin I.S.D. had 19% relocating, Leander and Del Valle school districts both had 18%, while Manor and Georgetown had 16% — and Lake Travis had 15%. These districts, it can be assumed, are relocating more than the U.S. as a whole, partially due to the high proportion of new housing being made available in these Texas suburban locations. The enrollment growth rates of the highest growth districts such as Leander I.S.D., Lake Travis I.S.D., Liberty Hill I.S.D., and others proves that over one-third of their students have moved into the area within the last five years! This forces the tenure of home-buyers to be shorter than the U.S. average. 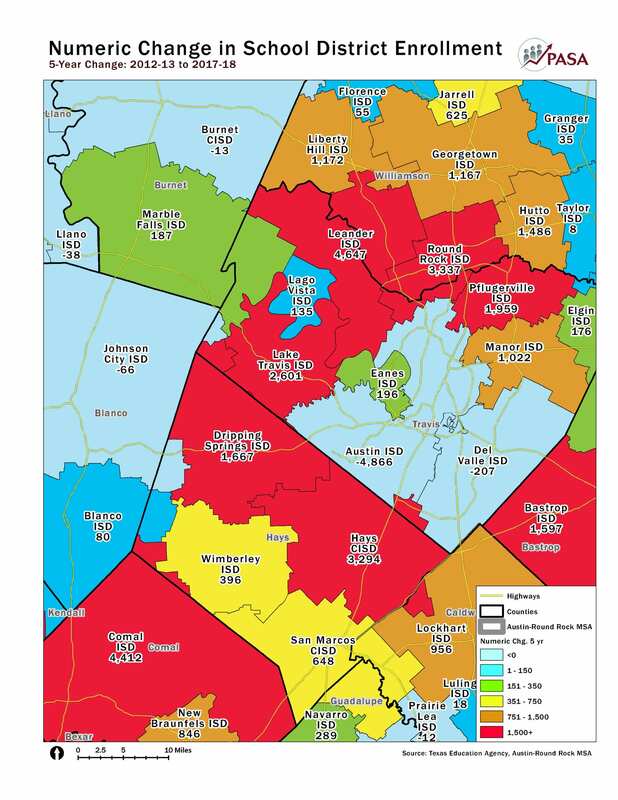 PASA’s 2017-18 Austin Metro Area map (including Travis, Williamson, Hays, Bastrop, and Caldwell Counties) provides five-year enrollment trends (below). •	Texas in 2016 Texas in 2016 had 22% ages 20-34 (with the younger ages not yet potential home-buyers) and the State had 16% ages 60 and over. The Austin-Round Rock Metro Area (being University-oriented) had 24% ages 20-34 and 15% 60-plus. Del Valle I.S.D. had 32% 20-34 and a very large 31% ages 60 and over. And, Manor I.S.D. had 27% ages 20-24 in 2016 and only 10% ages 60 and over. Refer to Census.gov for similar 2016 data available on other Texas school districts.